< Photo Credit: ©2013 Paul McAlpine and Mark Shinenaga for the Nihonmachi Street Fair "Aloha by the Bay™"
Nathan Aweau 's new CD 'Aina Hanau is inspired by his beloved Hawaii – and his first grandchild, Queen Lili’uokalani, Tahiti, and Nagaoka, Japan (Honolulu’s sister city). All original songs from the heart. Download the lyrics from the CD. 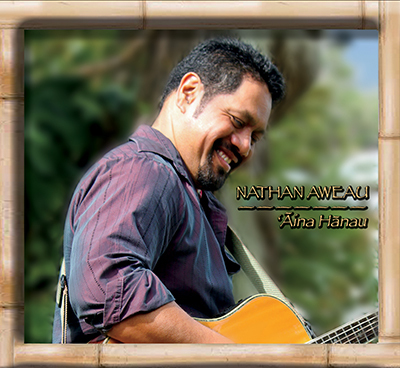 ‘Āina Hānau received the 2016 Na Hōkū Award for Song of the Year and the CD received the Island Music Album of the Year Award. ©2014 Nathan Aweau All Rights Reserved.